Turns out that building your own SketchUp online learning platform, AND recording the necessary video tutorials, is actually pretty time consuming. When I last checked, my to-do list had TWENTY FOUR items on it. Strangely, it’s a list that continually taunts me, by NEVER decreasing in size. But, as I type, progress on the new online learning platform is gaining SUPER momentum, with a launch date coming VERY SOON! Let’s have a recap, for anyone reading this and wondering, what on earth I’m talking about. I’m going to teach Interior Designers how to create their own floor plans using SketchUp; to support their design processes, increase efficiency and ultimately, to provide the best possible service to their clients. I decided to push ahead with the online learning platform, due to the very encouraging feedback I received via my survey (if you’re reading this and haven’t completed the survey, you’re still very welcome to complete it!). Have you ever recorded video tutorials? Wow, it can be so frustrating sometimes! Check out my bloopers! At this stage, we now have a name: SketchUp Hub and also a logo (see below), and we have fine tuned the benefits and features of the online learning platform. And I have to say, as far as (Interior Design specific), SketchUp courses are concerned, our solution is looking absolutely brill. Anyone reading this is very welcome to take a peek at the online platform. It’s still under construction, but it will give you a good idea as to the format and what we’re offering our members You are also welcome to register, and take one of the free SketchUp courses that has already been published (don’t forget to leave a review!!). Check out our new SketchUp online learning platform HERE. Going forward, we’re going to pilot the entire course contents, and once we’re happy that the content of the video tutorials is on point, we’ll be announcing an official launch date. We’re going to celebrate the launch with a giveaway, where one lucky winner will have complete access to the entire course free of charge. We’ll post a blog about the details, closer to the time! 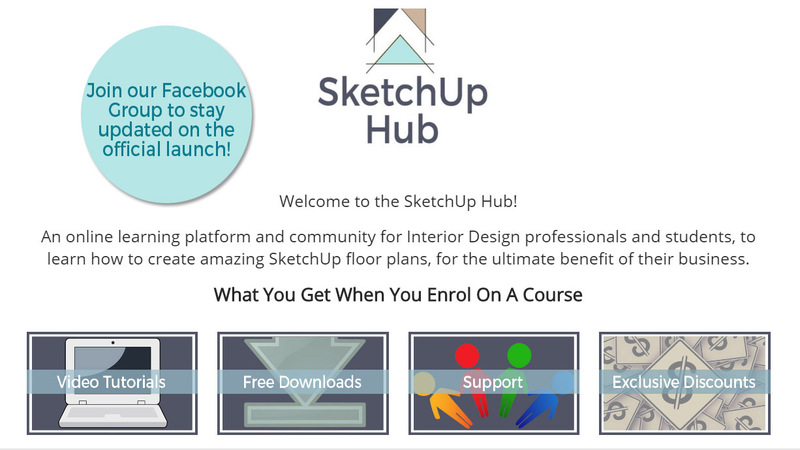 We’d also love to hear from some interior design bloggers, who would be interested in taking our SketchUp courses (for free), and then doing a write-up on their blog, outlining the features and benefits. Contact me if you’re interested! And lastly, please join our Facebook Group to view Sneak Peeks of the courses, and to stay updated on the launch! Watch this space, guys! Lots happening over the next month! If you have any questions about our new online learning platform, drop a comment below! Great idea, very much interested. Have been wanting to learn Sketch Up for ages.